This year’s rain storms have caused flooding in several states, such as Ohio, New York, and Pennsylvania. Homes that need cracked foundation repair or exterior basement waterproofing are at risk for allowing inches or even several feet of water to seep into basements. This could lead to water damage, mold, and other complications. The U.S. Federal Emergency Management Agency (FEMA) states that even a few inches could cause damage that will set a homeowner back thousands of dollars. One of the most important flood prevention tools you can have in your house is a sump pump. These are pumps used to remove water that collects in the basement. If the pump stops working, your basement could be in trouble if you do not invest in sump pump repair immediately. 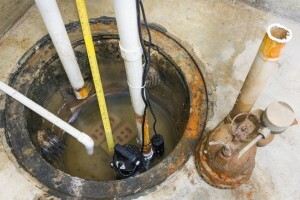 Your sump pump is like any other electrical appliance in your house. If the power fails, your sump pump will be rendered useless. The motor that is used to power the pump will stop working, and the water it is flushing out will likely rise and flood into your basement. There is no need for sump pump repair in this case. Instead, you should consider having a back-up sump pump for power outages in a rainstorm. Not every sump pump will be able to handle large volumes of water. You should at least have a one-third horsepower sump pump, which will be able to pump about 35 gallons of water a minute. This usually guarantees that you have enough power to keep your basement safe, but if you want to be even more cautious, you can buy a one-half horsepower sump pump, and also keep a battery-powered one just in case. If you live where the winters are harsh, you might find that your sump pump fails on you when everything thaws in the spring. The water that is suspended through ice will eventually melt and could cause an overflow, as it will be too much for the pump to handle the melted ice or snow in addition to a rainstorm. For these situations, you can have a sump pump extension installed to help remove the excess water if this happens to you. In addition to checking on your sump pump regularly, and either replacing or investing in sump pump repair when necessary, it would be wise to have exterior and interior basement waterproofing done. Taking these extra precautions could save you thousands of dollars worth of damage, and protect your home from the heavy rains this spring. Not many people are familiar with the intricacies of basement waterproofing but largely there are two fundamental approaches to the topic of how to keep water out of your basement. One approach is to stop it at its’ source, which would be to waterproof externally, while the other is to let the water in and manage it away, which would be interior waterproofing. Naturally the preferred method of choice is going to be to attack the source but sometimes this isn’t possible and an interior waterproofing solution must be implemented in its’ place. The severity of the issue may also give you no choice but to waterproof externally because the damage or possible damage is that severe. Here we take a look at the differences and benefits to exterior and interior waterproofing to help assist you in deciding which one is best for your basement. An interior drain tile system is often chosen when trying to rectify moisture seeping through into your basement. This is done by digging up the area next to the wall, fitting in a plastic pipe that is perforated, installing a membrane against the wall, and connecting this to a sump pump. This will serve to reduce the hydrostatic pressure underneath your property – this is the natural pressure that pushes water in an upward direction towards your floor and ultimately through the cracks therein. If, by chance, water does find its’ way into your basement, a sump pump ensures that it is safely removed in a timely fashion. One doesn’t need to be a rocket science to understand the logic behind its’ use. A waterproof membrane is produced from an asphalt-modified polyurethane material and is applied over the exterior of the foundation walls to ward off water penetration. While it is easily understood, it is costly to complete and often reserved only for the more severe wet basement problems as it requires the entire foundation to be dug out to allow application of the membrane. Much like the interior drain tile system, this one is merely applied on the exterior of the basement wall rather than on the interior side. It functions in the same capacity. These are the more popular methods of interior and exterior waterproofing. Depending on the severity of the problem, the cost, and the level of coverage that a homeowner is seeking, these three factors will ultimately decide which method is best for their situation. It is recommended to consult with a waterproofing expert before deciding upon a method as an expert will be able to assess the condition of your basement accurately. Aqua Tech Waterproofing is only a call away and offers a free assessment of your basement. With a 10/10 customer service rating on Home Stars and a proven track record of over twenty-five years of high quality work behind them, Aqua Tech Waterproofing can provide more information on the benefits of interior and/or exterior waterproofing. Why Do You Need Window Well Covers? Did you know that if you have a living area or a bedroom located in your basement that you are required by law to have some form of emergency exit from that room? While some houses are actually raised a bit so that they have small windows located in the basement near the ground, some basements are completely subterranean. For those types of basements, you will have to install something called a window well. Window wells are large holes dug into the ground near the foundation that allow a person to quickly and easily leave the basement. Basically, they’re a type of escape tunnel dug near the house that provides a way of getting out of the basement in the event of a fire or other disaster. However, installing a window well near your foundation can cause some issues. While there are several different things you can do to protect your home from the problems a window well can create, the cheapest and often the best solution is to install a window well cover. Creating a window well does make it easy to get out of your basement, but it also makes it easy for things like water, snow, mulch, and other debris to get in. This can cause a lot of trouble. Rain and melting snow, for example, can cause mildew and mold to grow in the window well or even down in your basement. It can also lead to cracks in your foundation, while debris can clog up drains and cause other damage. Protecting against all of this is the primary reason why you need to add window well covers to all of your window wells. These well covers should fit snugly down over the exit, keeping everything out while still allowing for an easy exit from the basement. Of course, you need a window well cover to mark where the well exit is, too. You can’t just create a hole in the ground and leave it unmarked or open. A good window well cover will be able to hold up to several hundred pounds and won’t collapse if someone steps on it. This is very important for safety, especially if you have children. The well cover will also make it very easy to see where the window well exit is located so you can be sure not to accidentally block it. Finally, most window well covers have a deadlock or a heavy bolt so they can be locked from the inside. If you install a window well cover that does not lock, you will have created a way into your home that in unsecured. Many burglars look for window wells because they’re often the weakest entry point into the home. Make certain your window well cover is securely fitted into the ground and locked from the inside. This will keep thieves out and will also make sure that the well cover doesn’t gap open. Any gap in the cover could allow insects and animals in, so you want to be certain it’s securely closed. https://www.aquatechwaterproofing.ca/wp-content/uploads/2017/03/AquaTech-Waterproofing-logo167.png 0 0 aquathethird https://www.aquatechwaterproofing.ca/wp-content/uploads/2017/03/AquaTech-Waterproofing-logo167.png aquathethird2014-05-02 16:09:152014-05-02 16:09:15Why Do You Need Window Well Covers?